Lisa joined the Weare Animal Hospital in the Winter of 2018. After time in the dark side of medicine (human medicine), she returned to her true calling in animal health. She previously worked as a receptionist/veterinary assistant for 17 years in another New Hampshire animal hospital. Since joining Weare, Lisa has enjoyed learning and experiencing exotic and wildlife care and treatment, expanding her knowledge and hands-on skills. 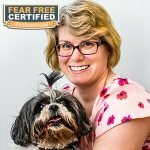 Most recently, she completed her Fear Free℠ certification. Lisa lives in Bedford, NH with her boyfriend and two Shih Tzus. She loves to go camping up in Ossipee, riding motorcycles, sewing and hiking in the woods with Kurtis and Happi, her pups.